Treasure Mountain Property | Nicola Mining Inc.
Nicola Mining Inc. owns 100% of the Treasure Mountain Property, an approximately 7,000 acre silver deposit consisting of: 51 mineral tenures, comprising 21 legacy claims: 100 cell units, and five crown grants for a total of approximately 2,850 hectares. Since its incorporation in March 1980, the Company has been engaged in the exploration and development of its wholly owned group of mineral tenures located at Treasure Mountain in the Similkameen Mining Division, British Columbia. After discovering a silver rich vein on the claims in 1985, exposing this vein for a length of 250 meters and testing it by shallow drilling in the summer of 1986, the Company went public in 1987, attaining a listing on the TSX-V in August of that year. Between 1987 and 1989, the Company explored the vein zone on four underground levels with 9,000 feet of crosscuts, drifts and raises, complemented by 5,500 feet of underground and 10,000 feet of surface drilling. Preceding the underground work, a bulk sample of 407 tons of select high-grade material from the surface vein showings was shipped to Cominco and Asarco smelters for testing. The smelters found the shipments compatible with their regimes and paid a total of $344,265 for the shipments. Since 1989, work at the Treasure Mountain Property has included four small drill programs, several geo chemical soil surveys, a legal mineral tenure survey by McElhanney and various technical studies by AMEC Earth & Environmental. On March 31, 2011, the Company made an application for a permit approving the Company’s Small Mine Plan and Reclamation Program pursuant to Section 10 of the British Columbia Mines Act for the development and operation of the Treasure Mountain Mine Project. The application allows for up to 60,000 tonnes a year of mining. Exploration at Treasure Mountain since June of 2011 has consisted of 69 diamond drill holes over a total length of approximately 7000 metres, 671 surface soil geochemistry samples, surface sampling, and underground sampling on the upper two levels of the mine workings, a 10,000 tonne bulk sample, and a small exploration cut on the East Zone .8km from the mine workings. 51 diamond drill holes were drilled over a total length of 5,073 metres on the main mine development, with the objective of further defining resources on the upper 150 metres of the mine. Highlights of the drill program are presented in the following table. The Company conducted a geochemical sampling program consisting of 671 samples focusing on two primary targets: the MB Zone and the Camp Zone. The MB Zone is approximately 800 metres northwest of the current Treasure Mountain mine workings. 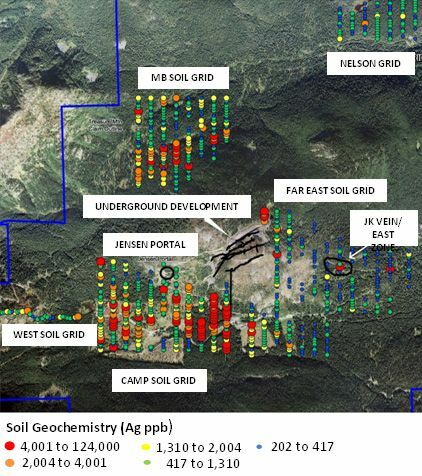 Surface samples were taken from an exposed area of fractured argillite in 2010 and assays were reported as high as 9,221g/t Ag (August 25, 2010 press release). The Camp Zone is in an area where a geochemical testing program conducted in 1996 identified a large soil anomaly below the Jensen Portal extending up to 1000m from the existing mine workings. These samples range from 0 grams per ton to in excess of 100 grams per tonne Ag. The D-vein was previously uncovered 20 metres into the hanging wall of the open cut at the top of Treasure Mountain. However, the surface expression was re-exposed during mechanical scaling. 8 samples were taken across the structure over a total length of 107 metres. The D-vein is not included in the current NI 43-101 resource estimate included in the Report. The Company sampled all currently developed drifts and raises from the upper two levels of the underground. To date, only the results from the Level 1 drift and raises extending 55 metres to the surface have been received. The mine is developed on 4 levels over a vertical height of 295 metres following the vein down dip. The samples were taken at 5 metre intervals throughout the drift and raises. Each set of three samples (i.e. P1C1-1, P1C1-2, P1C1-3) represent one sample location at each 5 metre interval. Each sample location includes footwall rock, vein and hanging wall rock. Footwall rock samples assays were received from 0 g/tonne Ag up to 3380 g/tonne Ag (98.5 OZ/ton Ag), 3.96 %Pb, 3.74% Zn and 3.89% Mn over 1.9 m.
Vein sample assays were received from 0 g/tonne Ag up to 5097 g/tonne Ag (148.6 OZ/ton Ag), 36.76%Pb, 5.31% Zn, and 6.45% Mn over .6m. The first underground stope mining commenced in November, 2011 and has currently been mined over a length of 75 metres, a height of 45 metres, with an average width of 1.5 metres. We have estimated that a total of 8,000 tonnes of material has been mined and stockpiled to date. The drawdown of the stope and removal of the crown pillar will provide an additional 12,500 tonnes of material in the summer of 2012. 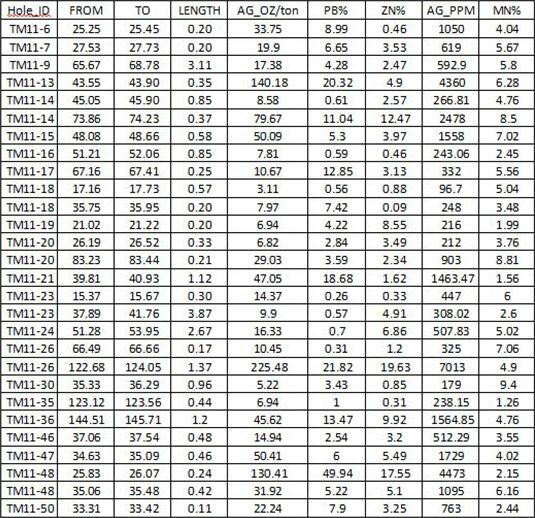 The average grades, to date, of the 43 samples over the mined width are 911 g/tonne Ag, 5.62% Zn, 3.35% Mn, 6.75% Pb. Currently, no value has been assigned to stockpiled material as the material requires further processing at the Company’s Mill facility, once complete, prior to being shipped to a smelter for payment. There are currently no other identified options for processing the material prior to shipment to a smelter. Since completion of the mining of the first stope, the haulage drift has been extended to a total length of 275 metres and the fourth raise has been completed. There are a total of 7 raises to be developed including the final mine ventilation raise to complete the development on Level 1 of the mine. The haulage drift will be complete at approximately 300 metres. On February 24, 2011, the Company announced it had acquired 70.7 hectares of additional surface rights on the Treasure Mountain Property. The Company now holds all of the surface rights on its entire 7000 acre claim boundary. Two of the lots were previously home to a former wilderness camp and had been previously logged. This provided the Company with the most suitable location on the entire claim to construct camp facilities.